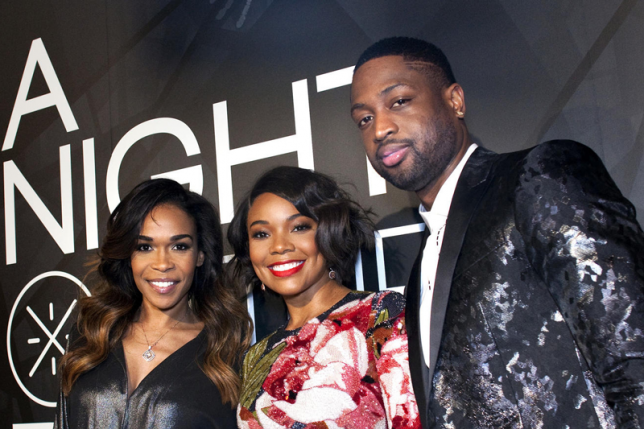 Chicago Bulls’ star Dwyane Wade hosted his fifth annual A Night on the RunWade on March 19 at Revel Fulton Market. Over 500 guests attended the sold-out fashion show event that featured looks from Dsquared2 and benefited the Wade’s World Foundation, a nonprofit that provides support to community-based organizations that promote education, health and social skills for at-risk kids. Wade partnered with Calyann Barnett (creative director/stylist for WWB Lifestyle) to create an immersive experience for attendees that included a variety of interactive displays. As VIP guests arrived, they were directed to a lighted tunnel, where they were encouraged to “strut their stuff” for the camera. The runway walks were videotaped for sharing on social media. Hot mixes were provided by DJs Coco & Breezy (twin designers Corianna and Brianna Dotson), and Champagne was served by an aerialist suspended from the ceiling. Pop-up stores showcased products that included Giuseppe Zanotti designer shoes, WOW 5 sneakers, Hublot (presenting sponsor) luxury watches and Coco & Breezy eyewear. (A portion of sales was donated to the foundation). Beauty for Real provided makeup touch-ups, and virtual-reality displays transported guests to a Jack Daniel’s distillery and a California desert. Tap-dancing twins Sean and John Scott ushered guests to their seats for the fashion show. Les Twins, Laurent and Larry Nicolas Bourgeois, kicked off the runway presentation with a hip-hop performance. The 15-minute show featured 40 looks from Dsquared2’s fall/winter 2017 collection. A crowd favorite was wool jogging pants paired with a streetwear-style T-shirt that featured Wade’s jersey number 3 on the back. Wade wore an ensemble from the brand’s upcoming capsule collection that he collaborated on with designers Dean and Dan Caten. Wade and Barnett, joined by three sets of twins, ended the show posing before a bank of photographers as the crowd stood and cheered. Notables in attendance included Chicago Bulls Jimmy Butler and Paul Zipser, Chicago Bears Roy Robertson-Harris and De’Vante Bausby, actor LaRoyce Hawkins, rapper Rockie Fresh, actresses Mariel Hemingway, Gabrielle Union and Yaya DaCosta, soccer stars Christen Press and Samantha Johnson, Chicago Bulls head coach Fred Hoiberg and former Destiny’s Child member Michelle Williams. “What inspires me most is knowing that there are a lot of kids out there like I was and that all it takes is for someone to believe in you or look at you in a certain way to change a life. I’m thrilled to have a platform to support them, especially now here in my hometown. … I’m lucky to be so blessed, and I know that when you’re given a lot, much is expected. I’m trying to leave the world a better place,” said Wade.